Danny Rowse kicked six goals in Lock Lane's 40-6 win. Picture: Matthew Merrick. Featherstone Lions and Lock Lane are through to the Ladbrokes Challenge Cup third round. 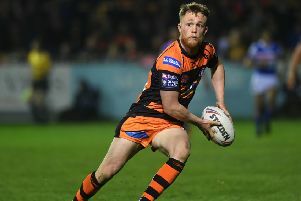 Lions, who reached the fourth round last season, pulled off a thrilling 14-12 win at Hull Dockers in the second round on Saturday. Lane eased to a 40-6 win at Shaw Cross Sharks after leading 24-0 at half-time. Lane’s Mike Hayward bagged two treies and Danny Rowse landed six goals from seven kicks. The third round draw is at Wrexham on Tuesday evening (7pm). The nine winning second round teams face sides from Kingstone Press League One on the weekend of February 27-28. Millom 12, Pilkington Recs 46; Siddal 18, Northumbria University 16; York Acorn 28, Distington 10; Hunslet Club Parkside 18, West Hull 19; Egremont Rangers 22, Rochdale Mayfield 26; Kells 42, Underbank Rangers 6; Wath Brow Hornets 30, Oulton Raiders 4.